SEOUL, Oct. 25 (Yonhap) — Another collaboration between K-pop superstars BTS and American DJ Steve Aoki is set to hit the world this week, Aoki has announced. “Surpriseeee. We’re back! Got a new collab with my brothers @BTS coming at u tomorrow!,” the Japanese American DJ said on his Twitter account Wednesday night (Korean time). 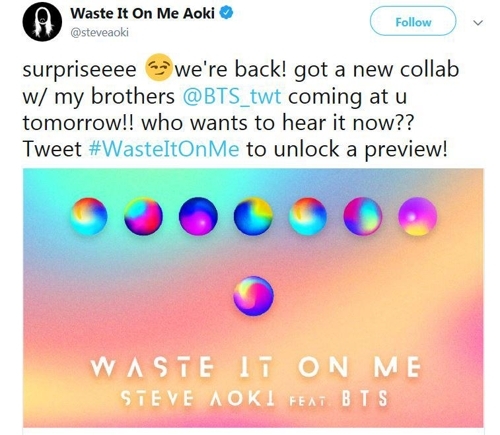 With the message, Aoki uploaded a publicity image for his new song, “Waste It on Me,” featuring BTS. The track is the third collaboration between BTS and the DJ.